Drummer John Eagan, born Athlone, Ireland in 1839. He enlisted as a thirteen year old on 10 February 1852. He was promoted to Private shortly after the Eureka Stockade and re-appointed Drummer in May 1856. Between 1854 and 1860, Eagan had been confined to cells on a couple of occasions and had also been on Sick Report in February 1860. Private John Egan (3059) was a drummer boy with the 12th Regiment. As the regiment were passing through the Eureka Diggings on 28 November 1854 John Egan was shot in the thigh. p. 9: Drummers and Fifers, WO 2971 or AJCP Reel 3714; 1 April periods payment made to John Egan. ordinary pay at 1 shilling and 1 pence. p. 64: 1 April - 30 June 1854 Drummers and Fifers; 3159 John Egan - Periods for which payment has been made to 30 September. To 30 September 92 days; On board ship 65 days. p. 39: Melbourne 17 November 1854.
p. 118: Drummers & Fifers: 3159 John Egan Payment made to 6 November 37 days, on board ship 37 days; written underneath in pencil "Disembarked 6 November 1854"
p. 142: to 9 April 1855 Pay Lists Declaration etc, Melbourne 9 April 1855.
p. 153: Declaration last pay list transmitted to WO being for period 30 September 1854 to 10 April 1855.
p. 157: First mention of Officers "Detached to Ballarat" Previously - up to p. 157 detached to Sandhurst and Castlemaine. p. 164: Drummers and Fifers, 1 October 1854 to 31 December 1854. 3159 John Egan - Period for pay at 1/1- is 7-55 In Regimental or General Hospital 21 days. p. 190: Account of Drummer etc and deceased to 31 December 1854. John Hall. p. 203: Littlehales deceased 12 February. 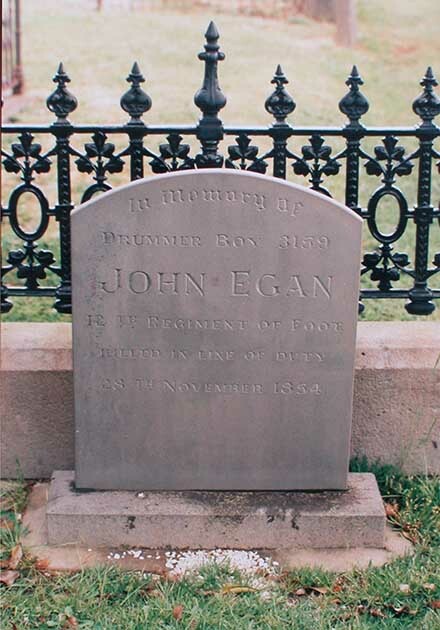 Drummers & Fifers 1855: 3159 John Egan to 20 February 51 days: 1 day in hospital. To Private 21 February 1855.
p. 229: Account of Soldiers: 3159 John Egan 23 February to 26 February - In guard Room on Board Ship 23-26 Feb 4 days. Amount 2/- Charge for subsistence @ 6d per day excluding the days in hospital. p. 501: Castlemaine 2 November 1854.
p. 2: (Note: this is halfway through the reel.) 1st Battalion, 12th Regiment 1st April 1855 to 30 June 1855. Note: the Regimental number of John Egan here changes from 3159 to 3059. Possibly a clerical error. p. 32 Death of Littlehales "from Winchester Parish of Winchester County"
3059 Eagan, John Number of voucher 3: 3 refers to the Quarterly Report of Courts Martial. p. 72: 3059 John Eagan 3 August to around 8 August then 21 August: 25 days in Guard Room then to Military Prison on August 9, 21 13 days but Total of days in confinement is 19 days. p. 75: In Hospital of 40th Regiment Ballarat. Wounded at Ballarat vide gen order herewith etc. p. 85: Refers to the Hospital at Ballarat. p. 103: John Eagan 3059, Voucher 1 October 6 to December 19: 1 refers to Courts Martial; Garrison Cell; In confinement 31 days. p. 187: 3059 John Eagan 1856 - 27 January to 31 March: 83 days 3 1/2d per diem; In Confinement 24th to 26th January. p. 207: 3059 John Eagan. Period of Forfeiture - 6 months. Date for which it commenced is 7 November - Number of days; already 43 days then 88/12 no. of days written down with the amount at 8/4d for 43 days (unreadable - in fold of register) Remarks: (hard to read) Pay? within Period of Sentence 12 omitted @ ?? 3059 John Egan 1 May to 30 June 61 days Appointed Drummer to Major Brown? 3059 John Egan, 26. 88 days at 1/1- : Absent 27.28.29 and in Confinement 30 September. p. 167: 3059 John Egan 14 Dec 1856; 16 days already deducted - 90 days to go. Amount 7/6d. Total number of days deducted 106. At the end of REEL 3718 we find that John Eagan/Egan 3059 spends many days absent and in Confinement. In October 1858 - 3 December 1858 he had been placed in confinement 29 August and released on 4 Sep, then to Barracks or Garrison Cells. On 31 December he is noted as a "Prisoner" and there are three entries for John Egan on p. 108.
p. 13: Pay :ists 12th Foot 1st Battalion 1859-60 and Depot. 3059 John Egan 8 Sep - 30 Sep; 61 days ordinary pay 1/1d; during 2nd Muster "Cells"; from Private 1 July then John Egan Private appointed to Drummer. p. 7: 3059 drummer John Egan up to 30 June 1860. ↑ http://users.netconnect.com.au/~ianmac/eureka.html, accessed 05 May 2014. ↑ Blake, Gregory, To Pierce the Tyrant's Heart, Australian Military History Publications, 2009, p.75.